From 2007 to 2016, the burglary rate in the US declined by 30.8%, according to the FBI. Whether this decline is due to an increase in technology or improved law enforcement tactics is unsure. Regardless of the reason for the decline in burglary, one thing is for sure: as the years have progressed, the technology available to deter burglary has certainly improved. If you’re a homeowner, there are a number of things you can do to reduce the likelihood of your home being burglarized beyond installing a burglar alarm system. But if an alarm system is what you’re looking for, check out the table below to see our home security system recommendations. Then keep reading to find out what else you can do to protect your home. Regardless of whether a burglar succeeds in their burglary attempt, the act can still impact your home, as anyone who has experienced burglary firsthand can tell you. One of the most devastating impacts that property crime has on its victims is the feeling of violation. Having a complete stranger target your home for burglary is just the first step of that violation. When personal property is destroyed or vandalized in an attempt to gain entry, that too leaves a feeling of being violated. A burglar certainly takes no care when rummaging through personal possessions, and this is perhaps the most devastating aspect of a successful burglary for the homeowner. So what can be done to decrease the chance of property crime? One of the most important things that someone can do to decrease the chance of experiencing property crime is installing security technology such as a burglar alarm system or security cameras.. The simplest, most effective action you can take to prevent future burglaries and protect your family is to install a monitored home security system. Security systems alert you when an intruder enters your home, and they have loud alarms that can scare intruders away before they can do any real damage. These systems also notify local authorities so they can investigate why the alarm was activated. Check out our best home security system recommendations to see what system would be the best fit for your specific needs and budget. 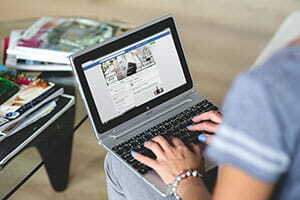 Whether you announce your big vacation on Facebook or you and a friend discuss an upcoming business trip at a coffee shop, mentioning travel in public forums is dangerous. In these types of situations, anyone could overhear you and know that your home is going to stand empty for a few days, creating the perfect opportunity to target your home. It’s especially important to emphasize to children that when they mention outings innocently on their social networking pages, they are opening the door to strangers who might want to burglarize your home while you’re out. Deadbolts make burglary difficult and burglars don’t like difficult. The more time a burglar spends in your home, the higher the chances are that they will be caught in the act. Deadbolts on doors make your home a more difficult target to break into, but it is important to purchase high-quality locks that can’t be easily compromised. Locks for exterior doors should be grade one or grade two locks, as these locks are more likely to resist a burglar’s lock-picking attempts and are less likely to give in to tampering. Good quality deadbolts will also have a beveled casing that will reduce the likelihood of the lock being compromised by channel lock pliers that are used with other lock types to sheer off the cylinder pins in the lock. Visit our best door locks article to find the best lock for your home. Or, if you are into more high-tech options, check out our recommendations for best smart locks and best digital door locks. Owning a dog ownership has long been a cited method of maintaining a safe home and deterring against burglars. When given a chance to burglarize a home at random, burglars are much less likely to target a home that has a dog. Large dogs are intimidating because of their bulk and intimidating bark, but even a small dog can be effective in warding off intruders. Take not that while having a dog in the home is a good security measure, that should never be the sole reason for owning a dog. Dogs require care and companionship, so unless you are prepared to take on a long-term responsibility that involves bringing another family member in to the home, you’re better off looking at other methods of deterring burglars. Getting a safe is one of the most important steps homeowners can take to secure important documents and priceless possessions. While a security alarm is a great way to protect the home against burglary, there is no assurance that a burglar will not somehow find a way to enter your home. All it takes is for one family member to forget to lock a door and all of the home security efforts in the world won’t make a difference. While safes may take up some precious storage space, they are the best way to ensure that important documents and other valuables stay out of the hands of home invaders. Once inside your home, burglars want to take valuables and leave in minutes; this leaves no time for breaking into a safe. 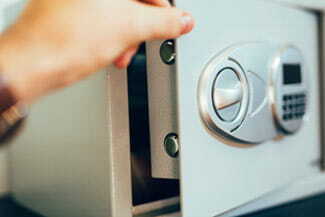 To see what safes we recommend, check out our best home safes and best fireproof safes articles. As a homeowner or renter, you should always carry a degree of insurance to help protect you against losses that may occur as the result of a disaster or theft. Most companies that provide this type of insurance prompt their customers to always keep a note of their valuable belongings. This practice ensures that if your home is targeted and you lose any valuable property is, police can identify it and you can be compensated under your insurance policy. While keeping a note of valuable personal property is not a deterrent method for burglars, it’s an important step to take to protect yourself in case of a burglary. Burglars do not work in well-lit areas because they have a much higher chance of being caught than in the dark. 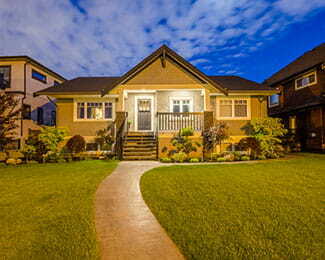 Make sure that outdoor lighting is always functioning well to maintain a safe property, Having a well-lit front porch means nothing if the back side of a house is not lit at all, so perform a full audit to determine the areas of your property that need more lighting. To see recommendations for the best security lights for outside your home, see our recommendations for best outdoor security lights. The presence of mail or newspaper buildup is a huge tipoff to burglars. Place a hold on mail delivery or have a trusted neighbor collect mail if you are going to be away for an extended period. Keep in mind that burglary is not the only concern when it comes to mail. All of those credit card offers and other secure information can be used for identity theft in the wrong hands. Consider getting a locked mailbox to prevent identity theft. Living in a neighborhood that enforces neighborhood watch is another good way to promote safety, not only for the individual homeowner but for the neighborhood at large. 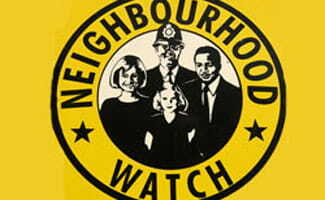 A successful neighborhood watch is one that involves an entire community of vigilant neighbors who work together. While it is rarely something that individuals take into account when moving to a new home or neighborhood, this type of cooperation is a key factor in discouraging criminal activity of all sorts. A paper shredder keeps your personal information out of the hands of anyone who would use it to steal your identity. For those homes with a significant amount of income, using a paper shredder is even more important because burglars are more likely to target homes where they feel that they can gain the most from the least amount of effort. Placing unshredded documents in the trash is not only a method for giving away personal information and increasing the chances of identity theft, but it is also a method for burglars to find out whether a home is worth the effort of being burglarized. Check out our recommendations for the best paper shredders. Sliding doors are a particularly easy way for home invaders to access your home because they are rarely fitted with secure locks or other security mechanisms. One affordable means of securing a sliding door is to place a curtain rod in the sliding track to prevent the door from being opened. While many home security stores sell more advanced products, most people find that this simple and affordable technique works just as well. Timing devices may seem like a rather old method for deterring burglars, but it is a method that has proven successful. So successful, in fact, that it has been built on as time has progressed. Timing devices are great tools to use whether or not you’re on vacation because they switch on lighting or technology within the home even when no one is home. One of the best ways to use timing devices is to program them for normal times of activity when your family is out of town. Setting timers to turn on lights, turn down blinds, and turn on radios or televisions is a way to give the impression that the normal daily routine is in progress even when no one is home, deterring potential burglars. Timers also make a safer home for those who live alone and those whose partners are frequently out of town. Burglars often observe properties they plan to burglarize to detect patterns of when the home is active and when it is empty. If your home has a garage, it’s a good idea to keep the car inside the garage. Otherwise, your car sits out in the open where any passerby can see when you’re home, making your house an easier target. While most of us understand the basic concept of burglary, not many of us understand the specifics of what defines burglary or that there are actually four classifications of burglary. So what is burglary in its basic definition? Burglary is the unlawful entry to a structure, and it does not always involve theft but may sometimes. The important thing to remember about burglary is that it involves someone entering a structure when they’re not authorized to enter said structure. While burglary for some is synonymous with breaking into a building, it can also include entrance through an unlocked or open door or window—so long as the person has no right to be there. There are four types of burglary: completed burglary, forcible entry, unlawful entry without force, and attempted forcible entry. All of these types of burglary involve legal ramifications. Completed burglary takes place when an individual is not legally permitted to be in a structure, yet they enter said structure, with or without the use of force. Forcible entry takes place when a person that is not legally permitted to be in a structure enters said structure using force. Force can be classified in a number of ways including breaking a lock from the door, breaking a window, or slashing a door or window screen. Unlawful entry without force takes place when an individual that is not legally permitted enters said structure without using force. This type of burglary can involve entering a home through an open or unlocked door or window. Attempted forcible entry takes place when a person attempts to enter said structure by force. Since this is attempted forcible entry it does not involve the actual entry in to the structure. This type of burglary can involve the burglar trying but not succeeding in their burglary attempt or being caught during the act of forcible entry. Always keep all doors and windows locked. Install a home security system as soon as possible. See our top recommendations by visiting our best home security systems page. Hopefully, you will never experience a home invasion, but if it does happen, call the police and keep your family out of harm’s way.